“Are you going to blog about this?” my brother asked. What a whirlwind weekend. It was magnificent, mainly because I got to spend much of it with my siblings and their spouses in the upper part of the state. John, one of my young handsome nephews, was there too. It’s always a plus to have someone of the younger generation to keep us informed and up-to-date. Thanks to John, I now have a Dragon Dictation app on my iPhone that I’m thoroughly enjoying. Whodda thunk I could talk into my phone and that my speech could be immediately turned into text that I could send to anotherperson? Back to the weekend, the primary purpose of getting together was to attend the wedding of Ben and Jessica Fowler. Ben is the son of my sister-in-law Lisa who’s married to my brother Mike. I could go on and on about the wonderful time we had and the memories we made, but that really isn’t the purpose of this blog post. Okay, maybe I’ll say just a little about downtown Greenville. If you haven’t been in a while, you should. 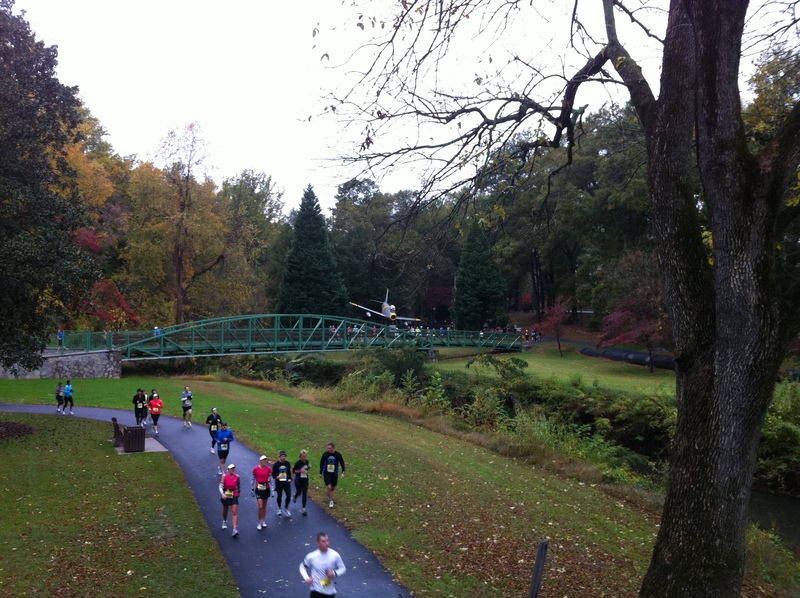 I went for a walk along the Reedy River Saturday morning and found myself caught up in a running event. Fun…as long as I kept to the side of the path. The scenery was beyond description, so I won’t even go there. We all loved the Farmer’s Market on Saturday morning, the foray into the Mast General Store, and our lunch at a quaint little andwich shop. An added plus was seeing all the little children dressed up in their Halloween attire. On Friday night, we attended the rehearsal dinner at Larkin’s, and the food, entertainment, and company were all just perfect. My sister-in-law and her friend Elaine had decorated each table in such creative ways that I can’t do them justice with my writing. I won’t even try. Suffice it to say that we all took our burlap cutlery holders home and that I’m going to tryto duplicate their design for the upcoming Thanksgiving holiday. The holders, by the way, were just one of many extraordinary touches that made the evening delightful. The toasts, the laughter, and the overall ambience of the environment combined to make it memorable. Later the next day, we went to the Cliffs at Glassy for the wedding. High on Glassy Mountain, there’s a chapel that overlooks the mountains and one of the most majestic views I’ve ever seen. That’s where the vows were exchanged, and I couldn’t help but think that if a person couldn’t feel the “spirit” there atop a mountain and on a level with the clouds, then he or she must have issues. After the beautiful ceremony, the bride and groom asked the entire wedding party to come outside for a group photo. With them at the front and the rest of the party behind them, the photographer stood atop a high hill and took the picture. Then we sipped hot apple cider and savored the chilly autumn afternoon while other photographs were made. With reluctance, we left the mountain and rode around and around the winding road until we reached the bottom of the hill. At that point, we went towards Hendersonville while the rest of the party headed back to Greenville for the reception. From every account we’ve heard, it too was fabulous. The food, the band, and the beautiful setting were the stuff of memories. Back to Mike’s question. Although I’ve written a little about the weekend itself, I have even more to say about marriage in general.Weddings always provide food for thought. When you see a couple preparing to love each other till death do they part and so on, it makes you think about what that’s all about. What does that stuff about “in sickness and in health, for richer or poorer” really mean? Stay tuned for some answers that I picked up from wedding toasts and a little informal polling. I've never attended a wedding so close to heaven.